After several weeks of waiting, you've finally returned to us in NY. It's a sad day because we have to say goodbye for a second time, and I'm not very good at those. You know what I'll always remember Grandma? 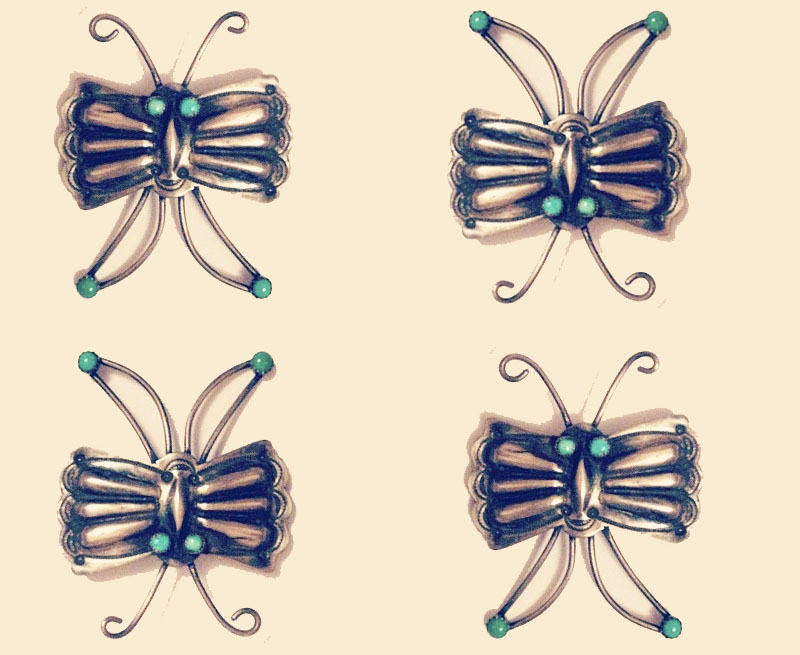 That we loved all these butterfly pins you collected. It was like our own special secret. When I think about it, there is a lot we didn't know about each other. I bet you didn't know that just the other year, mommy, daddy, the BF and I went to Santa Fe. Guess what? It was one of my favorite trips EVER. I suspect you've been there too based on my favorite butterfly pin of yours (the one with the silver and turquoise). Looking at all of these pins that you've collected I have so many questions for you. Why did you start collecting them? Did Grandpa ever get you any? Which one was your favorite? I know at some point you must have told me all of this but I can't remember now and I really wish I could. I have a secret for you, I miss you. I really (foolishly) thought you'd be around forever. But that's ok, because there is so much that happened these past 24 years that I'm grateful for. I'm grateful (first off) that you were around for so long. When my other grandparents passed so early I was happy to know that you were there. You were present for all my big moments; my graduations, my sweet sixteen. And although you won't be there for one of my biggest moments, my wedding (whenever that may be), you'll be there in spirit. I'm grateful that you got to meet Henry. Although he is not my own son, I love him so much and I'm glad I got to see you with him. He brings so much joy to my life and I'm happy he did that for you too. It's good he got to meet his great grandma. We have pictures of the two of you together so he can never forget. I'm grateful that in the end, when you didn't remember much, you remembered the BF. And although you two never got to meet, you never failed to ask how he was and what he was doing. Of all the things you didn't remember, it meant so much to me that you remembered him. I'm grateful that the last couple of times I got to see you, you remembered exactly who I was. That you held my hand and told me I was beautiful. I'm happy that although I wasn't there for the very end, I had seen you a month before, and I can remember exactly what we talked about. I don't want to feel sad because I know that this was bound to happen. I know that you missed all your loved ones who had gone, and that you're now reunited with so many people you love. It really hasn't hit me yet that you're no longer here, but I know that when we place you next to Grandpa this will really be it. Grandma, I want to thank you for all the, "I love you all the muches" and wind up kisses. Give grandpa a kiss from me, and tell Grandpa Qique and Grandma Anna that I love them. If you see Kathleen, give her a big hug from me as well. Here's to one last wind up, and one last kiss.